Does your Back-to-School checklist include an eye exam for each of your students? It should. Did you know that one in four school-age kids has some form of vision problem? And only a small percentage of that group is identified in a school screening. As you might expect, when a student can’t see clearly, learning and attention can suffer. So, whether it’s the first day of kindergarten or the first day of college, a comprehensive eye exam by Dr. Williams or Dr. Bloom can help maintain the proper vision that is so essential to your student’s academic success. 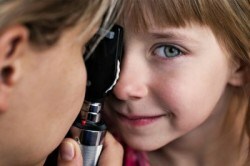 Fortunately, if the examination reveals the need for some vision correction, now’s a great time to be a kid! Wearing glasses is a fashion statement. At Weber Vision Care, we have the area’s largest selection of kids’ eyewear, which means we have the perfect frame for both your taste and your budget. From “glitz and glam” to “geek chic” to “indestructible titanium” we have tons of specs to choose from…. We know that this time of year can be very hectic as you try to fit Back-to-School errands in with all your other activities. We do hope you’ll take a moment today to schedule an eye exam for the students in your family. Their report card will thank you! And to thank our patients for their loyal support, with every child’s comprehensive Weber Vision Care eye exam, we are offering 50% off all kids’ frames and lenses! This offer applies to any kids’ frame in our collection, not just a few select frames. This offer expires at the end of September, so we do hope you’ll call soon. P.S. We’re sorry, but this offer isn’t valid with other offers, discounts, or with NVA, VBA, Davis Vision, or Eyemed vision plans.